Osprey’s new Black Ops rule set is mostly intended for modern or near future action, but I wanted to give the rules a go with my WW2 miniatures. We ran the “assassination” mission, with a crack team of British commandos sneaking in and trying to bump off a German officer. Turns out the rules work absolutely fine with no modification for WW2 action. This was our first time using Black Ops, so I didn’t want to try anything too fancy. The game is all about the stealth rules, so I wanted to use those. We went for an elite team of attackers, and while the defending Germans would be conscripts (this is supposed to be a safe area behind the front lines, so this is a second-rate unit). Since both sides were military I wanted that quality mismatch to make it feel like a commando raid. The Brits will only succeed if they use stealth to the maximum, as they’re outnumbered about 2:1. Almost nothing was needed to adapt the rules to WW2. We count all SMGs as PDWs (it’s essentially the same thing). The standard weapon for most troops in Black Ops is an assault rifle, but we dropped that to a bolt-action rifle. This means each man only has one shot per activation instead of 2-3 and there would be a lot more aimed fire going on. All the points costs are helpfully included in the back of the book, which makes life simple. So that makes 23 men on table to start. All troops have fighting knives or bayonets and hand grenades. One of the main differences you get when playing Black Ops in the 1940s is that you just don’t get a lot of the fancy weapons and options. No flashbangs or grenade launchers, and certainly no HALO insertion! The white farmhouse stood at the crossroads, and would be where the general was kipping for the night. There was a barn and a shed out the back, with two more farm buildings over the road (one ruined). 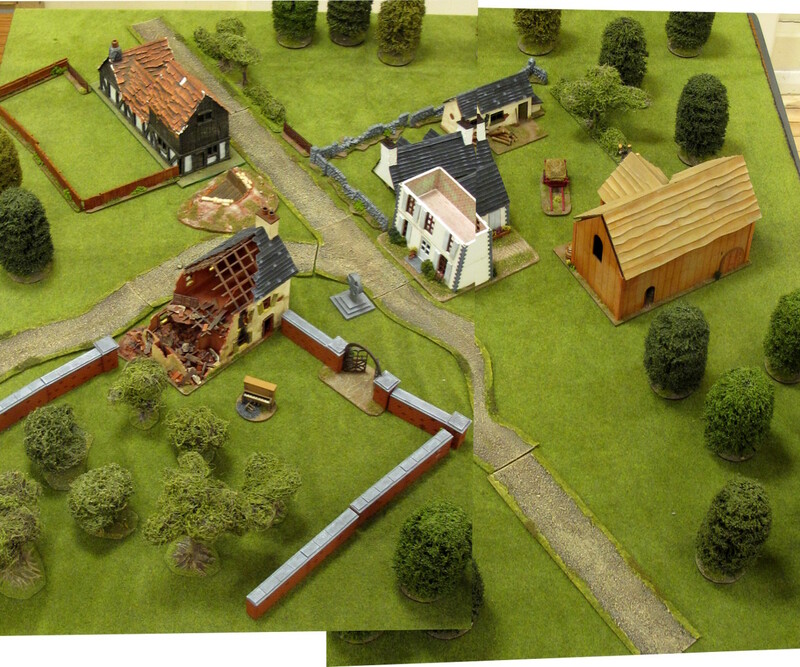 Woods surrounded the village, and the Germans had a gun pit at the crossroads. Walls of varying height gave the attackers something to hide behind. You don’t need a big table for Black Ops, this one was 4×4 feet. The Germans have half their forces in the village (General, driver, radio operator, 1x MG team, and 7 riflemen), four men are on guard duty and the rest are sleeping in the barn or the farmhouse and the machine gun is guarding the road. The rest of the force is returning from a patrol. All except the guards were deployed on blinds. The British force split in two, with one leader taking the Bren team and sniper while the other took all the riflemen. The plan for the Germans was pretty simple: try to detect the attackers as quickly as possible and get the general out. There were two options for that. First was his staff car and driver, if that was looking too risky then the defenders would just have to try to pin down the attackers long enough for the radio operator to call up for the half track. The British commandos had a tougher job, but a pretty straightforward one. Identify which blind was likely to be the German officer, then get to him and do the deed. 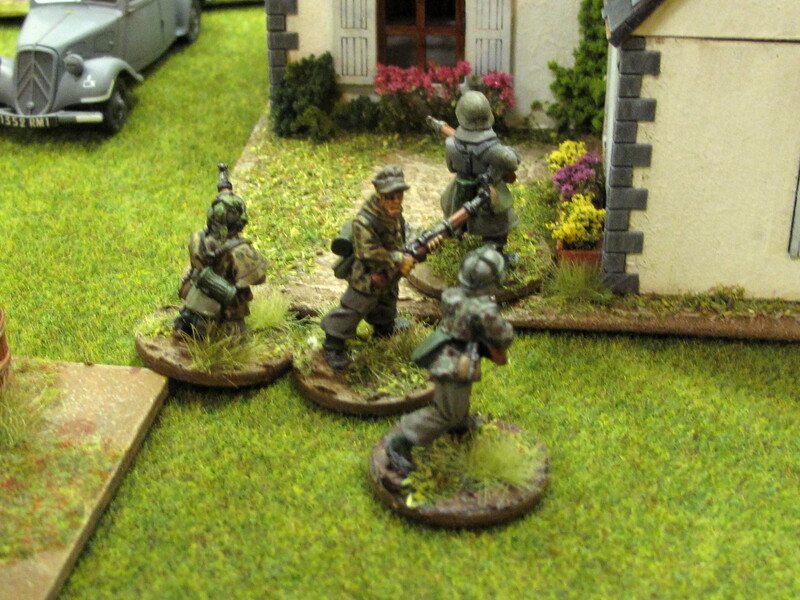 German guards spot the commandos early and force them to sneak away. The British had deployed their rifle team cheekily close to the German blinds on one side of the board, so I took some Germans off their blind and the guard reaction roll took them right towards the Brits and one of the guards spotted them straight away. Instead of shooting I opted to shout “Intruder Alert” as this put two noise markers on the Brits. A red jack came up soon after though, and the commandos snuck away behind the fence, leaving the guards confused and milling about. Guards are controlled randomly until the alarm is raised, but the amount of noise counters in play reduce the randomness somewhat. Despite their early success however my guards were having none of it and consistently milled about doing nothing much. 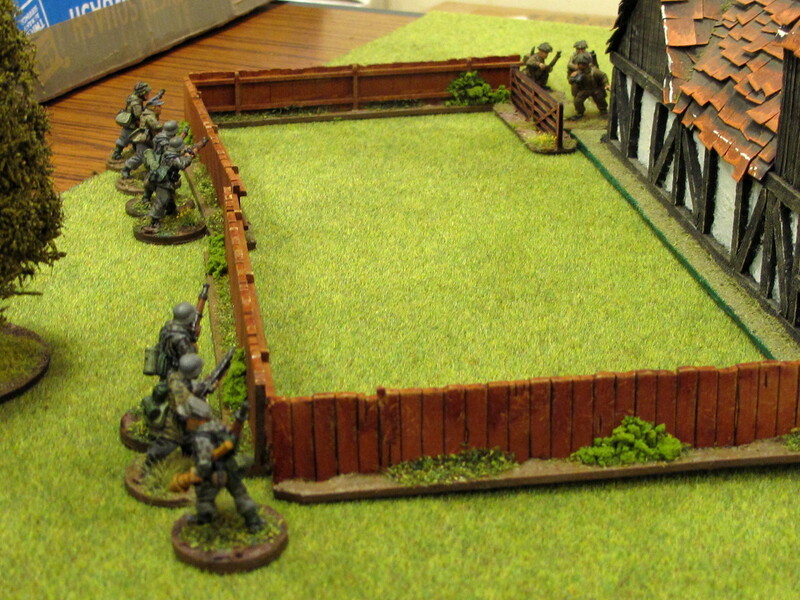 Over the next few activations one of the German machine gun teams patrolled back and forth over a fence several times. I have no idea what they thought they were doing. 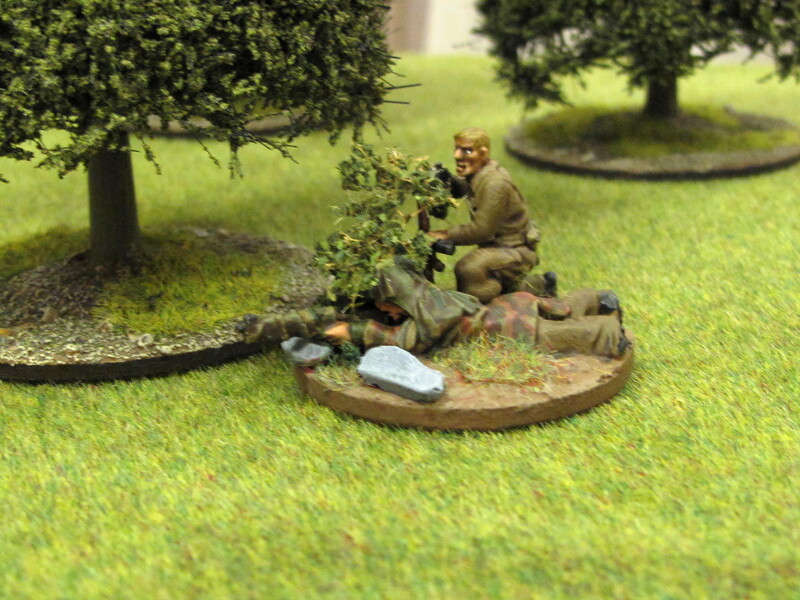 On the other side of the board the commando C/Sgt was creeping forward in the woods with the Bren team. They’d already set up their sniper with a good shot right down the road, so he stayed on reserve whenever his activation came up. Nearby were two sentries, one of whom patrolled off behind the house away from them, but the other insisted on coming straight towards the woods where the British were skulking. It was only a matter of time before he spotted somebody, so when a red king flipped over the Bren team decided to take him out. The two commandos rushed out of the woods with knives drawn and jumped the hapless sentry. The young conscript stood little chance in hand-to-hand against two special forces troopers and died silently. Meanwhile the other commandos had given the guards the slip and worked their way around to a house, but they found the door was locked and didn’t fancy kicking it in. A sentry was coming down the road towards them, so they quickly nipped across it in the dark and disappeared into the hedge beyond. The treeline would allow them to work their way around towards the farmhouse where the target was suspected to be (his staff car was parked outside, so a fair guess). 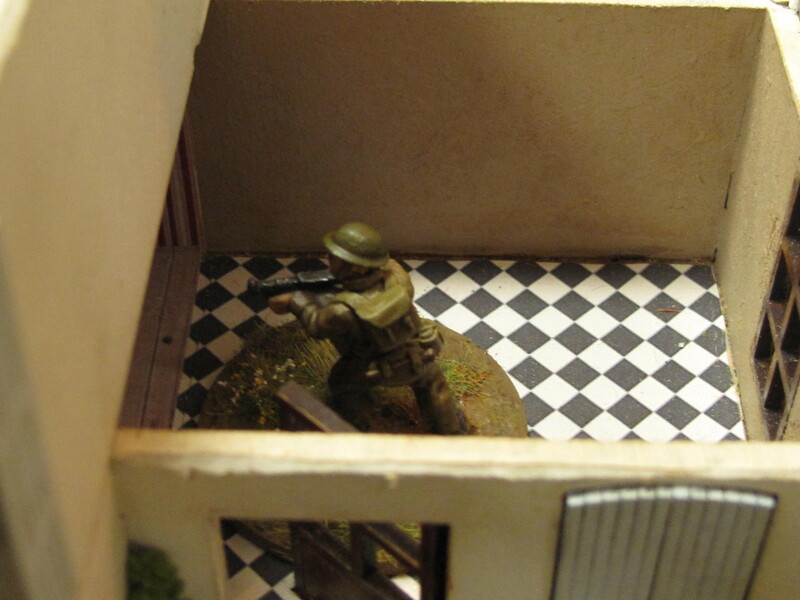 With one sentry down and the other wandered off the C/Sgt took the chance to move up and inspect the barn. Peering at the blind inside he saw three German soldiers, so thought twice about rushing them. Skirting around the barn he made his way to the kitchen door of the farmhouse, while his Bren team crossed the road and took up a position covering the front of the house. As luck would have it the kitchen door was unlocked and the commando slipped inside. Meanwhile a couple of turns had passed and the Germans had racked up nine points of reserves. It was enough to get a couple of extra riflemen but I wanted to hold out for the half track. Time was running out though as the commando NCO snuck upstairs to the general’s bedroom. German luck suddenly turned though, as a black Ace flipped over and the general rolled a six for his reaction. With the two noise markers in play this was enough. The general sat up in bed, grabbed his pistol off the night stand and yelled “Alarm!”. His pistol shot went wide, but the stealth game was now over and his driver and radio operator were awake. Unfortunately for them the commando was able to shoot first, and fired a burst that took down the poor driver. The radio man managed to activate and took a shot at the British soldier with his rifle, but missed. Another burst from the commando cut down the radio man, leaving the general alone with his would-be assassin! Meanwhile the German guards were scrambling for the house in numbers. Two leapt a small fence and dashed out into the road, but the commando rifle team rushed out of the woods and shot them both down in a hail of accurate rifle fire. 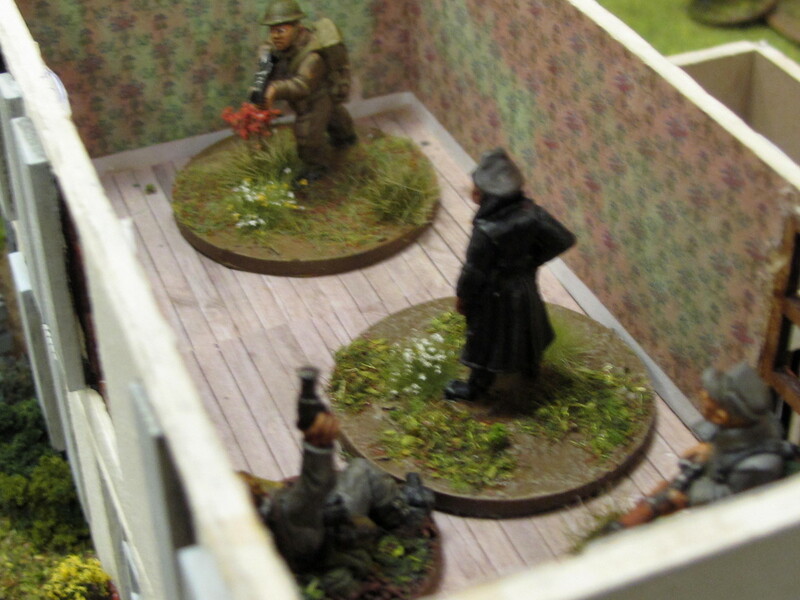 The three Germans in the barn dashed out and started running towards the back door where the Brit had snuck into the house, drawing fire from the Bren and sniper who hit one man. German troops were dropping like flies now as the accurate shooting of the raiders rang out. Upstairs in the bedroom though the most important fight raged; if the British NCO got to activate first he could cut down the general and win the game. It was the general who activate first though, and his second shot was a lot more accurate than his first, hitting his attacker dead centre and sending him tumbling back down the stairs. The general was safe for now, but he had to get away before the commandos tightened their noose. The British officer and his rifle team had already dashed through the woods (no need for stealth now) and had crossed the stone wall at the back of the farmhouse and were hiding behind the woodshed. The two German soldiers who had made it to the house went on the defensive, one staked out the kitchen while another took up a position at the corner of the barn and fired a shot at the Bren team (but missed). 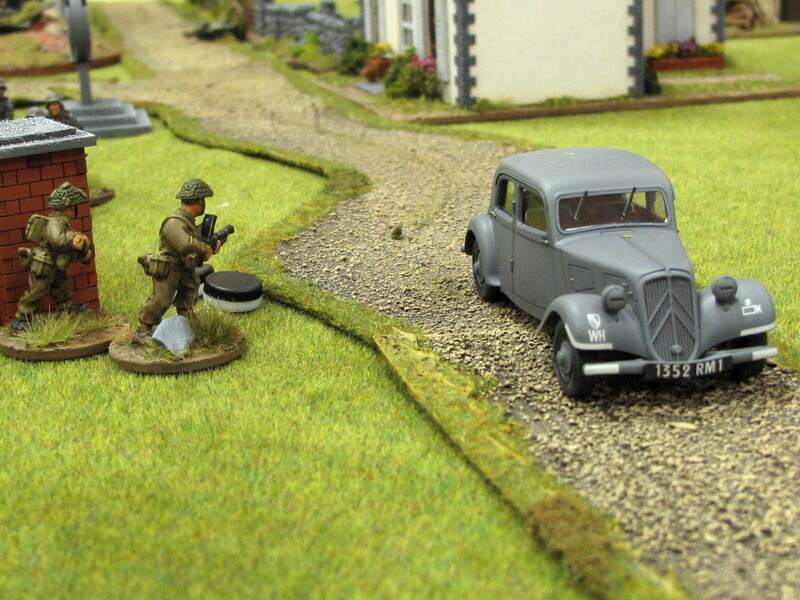 Suppression markers on the Bren team, while the general floors it in his Citroen. More Germans were pouring through the ruined house trying to get to the Bren team, and their MG42 at the crossroads opened up, putting suppressive fire onto the Bren. Meanwhile the general took advantage of a good run of cards to run downstairs and out to his car, then hopped in and started the engine. To cover his escape a group of riflemen broke cover near the Bren gun and fired at it from short range, but all missed! More black cards flipped over, and the general pulled out onto the road and gunned the engine, speeding down the road past the Bren gun. He was nearly home free! The next card to flip over though was a red king: British heavies! The commando sniper had been giving spectacular lessons in how to miss 2+ shots all game, but this time he was dead on target. 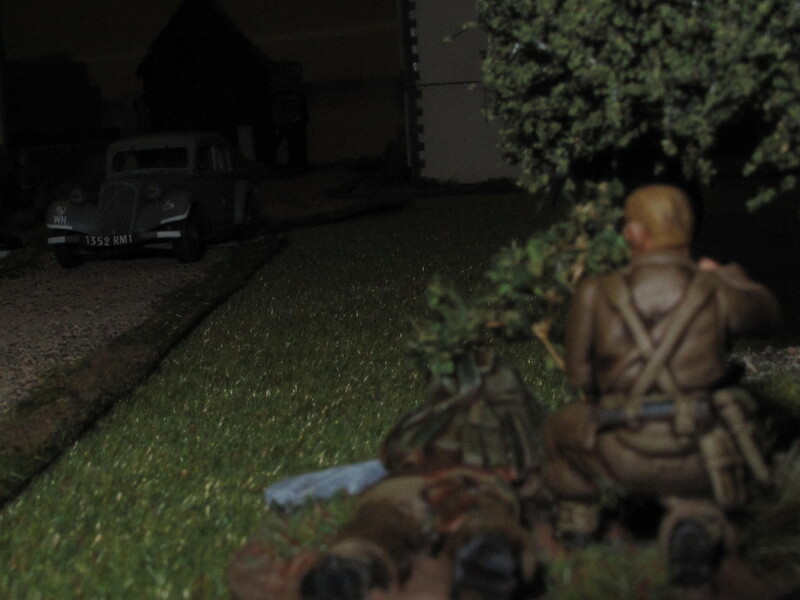 In the dark, the sniper pegs the German officer as he speeds down the road. A single shot rang out and the staff car lurched to a stop with the general dead at the wheel. Mission accomplished, and a great cinematic ending to a tense game. The British lost one man, their Colour Sergeant who lay dead in the upstairs bedroom. The Germans lost 6 soldiers, plus the general obviously. The game was really enjoyable, and proved that Black Ops works fine for WW2 games as is. We got a few rules slightly wrong, the biggest being that we forgot to remove noise counters at the end of each turn (whoops!). But any rule set that gives you a good game first time out when only one payer has ever read the rules is ok in my book. Sentries can behave pretty bizarrely. Be ready for them to wander aimlessly outdoors. Put some inside the building containing the target, they shouldn’t wander off and if someone jumps them it’ll make noise the commander is more likely to hear. Attackers have a pretty big advantage in that they’re generally in cover the whole time. Conscripts in the open hitting and saving on 5’s will get hammered by Special Forces in cover hitting on 2s or 3s and saving on 2s. Saving up to get vehicles as reinforcements is difficult, even with an RT specialist. I managed to get 11 points, just one short of the 12 needed to bring on my Sd.Kfz.250 rescue. Great report! I’ve been wondering about these rules. Creating realistic movement for programmed opponents is tricky at best and I wondered how well this rule set handled it. Great terrain too! The advice in the rule book is pretty common sense. If the result you roll doesn’t make sense then it says to change it the minimum amount to come up with a sensible result. There’s a nice simple system where the movement of the guards gets less random as the attacker makes more noise. Nice report! Interesting too, that the rules are useable for WW2. Will give them a gander I think. The only real change I made was to the equipment each man carried. Drop the body armour and switch the assault rifles to bolt action ones. The points values for everything are in the back so it’s easily done. Wow, thanks for the great write up Andy, It was a exciting read, wondering whether the Brits were going to complete their mission or not. That final shot from the sniper was a beauty, to be sure. OOh, very good idea, it may be gets my bro to the WW2 gaming as he likes Black Ops, but even CoC is to big for him… However as I do not like the original armybuilding in Black Ops I have sort of created new WW2 List via our blog.